Gen. Qasem Soleimani Revolutionary Guard Corps Quds Force has facilitated killing of Sunni civilians in Iraq by radical Shiite militias that also bully Iranian dissidents at Camp Liberty, Iraq; armed troops that destabilize Yemen and threaten Saudi Arabia; and helped Assad remain in power in Syria, which set the context for gains there by the self-proclaimed Islamic State of Iraq and Syria (ISIS), aka Islamic State. According to 21 May 2015 congressional testimony by Dr. Fred Kagan, “…Shia militia forces are part of the Iranian military de facto. The Badr Corps, run by Hadi al-Amiri, reports to Qassem Sulemani, the commander of the Quds Force. “Kata’ib Hezbollah [is] run by Abu Mahdi al Muhandis, reports to Qassem Sulemani, commander of the Quds Force.” Because the Iranian regime is part of such problems in Iraq, it should not be a part of solutions. The takeover of Ramadi accelerates the appeal of ISIS to Sunni Iraqis who had been fence-sitters; tribal leaders are especially vulnerable to defecting to ISIS as its momentum increases. During 2014, local Iraqi Sunni grievances against the Shiite-led government in Baghdad and ISIS controlled more than half of the territory around Ramadi; by springtime of 2015, it controlled even a greater share of Ramadi. Regional allies like Saudi Arabia may be less willing to act in the coalition against ISIS and may be more inclined to overlook Saudis who assist the Islamic State. 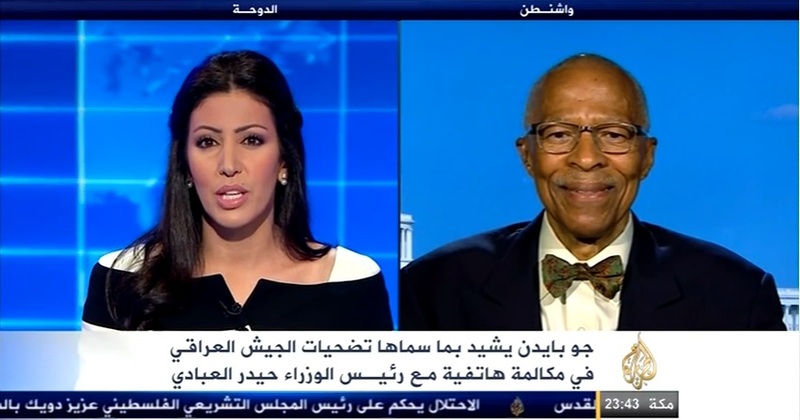 Research indicates that Washington needs to listen and hear Saudi Arabia and Egypt, as ISIS makes gains in Yemen and in the Sinai Desert. Instead the Obama administration is so strongly inclined to obtain some sort of a nuclear deal with Iran that Washington is willing to ignore Tehran’s efforts to destabilize the region. Regarding the Lausanne framework deal, on one hand, regional allies are especially concerned that the Iranian regime will receive sanctions relief upfront and such reprieve will be difficult to snapback. On the other hand, the framework institutionalizes Iran as a threshold nuclear power legitimately able to develop nuclear weapons whenever it decides. In this respect, the framework recognizes the Iranian regime’s assumed right to enrich uranium on its own soil, contrary to a half of dozen UN Security Council resolutions that denied Tehran this claim. As the 23 June rally in Villepinte, France draws closer, one is reminded of Daniel Pipes’ 2007 and 2009 articles on similar events. See following post and 2009 article post that follows later on the page. Navigating the fractious currents of émigré politics is never easy, and especially for the Iranian opposition group known as the Mujahedeen-e Khalq or the People’s Mujahedeen of Iran. Simply put, the rogue oil state regime it opposes terrifies one half the West and tempts the other, and the MEK is itself accused of being a superannuated Marxist-Islamist terrorist cult. These obstacles have not, however, prevented the MEK from trumpeting Islamism as the new global threat, providing important intelligence to the West – for example, about Iran’s nuclear program – terrifying the regime in Tehran, and putting on major displays of anti-regime solidarity. Participants at a Mujahedeen-e Khalq rally outside Paris on June 30 boisterously welcomed Maryam Rajavi. I witnessed one such display at a vast exposition hall outside Paris last week, where some 20,000 Iranians from around the world met to hear music from the old country, wave flags and banners, and listen to brief speeches by non-Iranian well-wishers – notably U.S. Congressman Bob Filner, Democrat of California, and former Algerian prime minister Sid Ahmad Ghozali. The crowd then settled in for an 85-minute tour d’horizon by the MEK leader, Maryam Rajavi. The meeting inspired several observations. First, the slick production, with hints of an American political convention – balloons and chaff falling from the rafters, a televised sequence of the leader arriving in cavalcade – was aimed mostly at an audience outside the hall, especially in Iran. Second, the event had two apparent goals: reminding Iranians that an alternative does exist to today’s theocracy, plus pressuring the European Union to remove the MEK from its terror list. For Iranians, the music portion included pretty girls in (for them, daring) Western clothing. For Europeans, it pointedly included “Le chant des partisans,” the anthem of the French Resistance during World War II. Third, Rajavi’s in-depth analysis mentioned neither the United States nor Israel, something extremely rare for a major speech about Middle Eastern politics. Nor did she even hint at conspiratorial thinking, a deeply welcome change for Iranian politics. Finally, no other opposition group in the world can mount so impressive a display of muscle as does the MEK, with its thousands of supporters, many young, and a slate of dignitaries. Young singers at the Mujahedeen-e Khalq rally outside Paris on June 30. 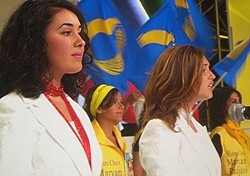 Many participants wore vests inscribed with the slogan, “Notre choix, Maryam Rajavi,” an allusion to the MEK leader. These factors, combined with the mullah’s near-phobic reaction toward the MEK, suggest that the organization presents a formidable tool for intimidating Tehran. But the MEK poses no danger to Americans or Europeans, and has not for decades. It does pose a danger to the malign, bellicose theocratic regime in Tehran. The MEK’s utility to Western states is reflected in the inconsistent, even contradictory, U.S. government attitude toward it over the past decade. One amusing instance came in October 2003, when Colin Powell, the secretary of state, tartly wrote Donald Rumsfeld, then secretary of defense, to remind him that the 3,800 MEK forces at Camp Ashraf in Iraq were supposed to be treated as captives, not as allies. But there will be nothing amusing as the American presence in Iraq winds down and thousands of unarmed MEK members are left to the tender mercies of the pro-Tehran regime in Baghdad. Belatedly, the Bush administration needs to take three steps. First, let the MEK members leave Camp Ashraf in a humane and secure manner. Second, delist the organization from the terror rolls, unleashing it to challenge the Islamic Republic of Iran. Third, exploit that regime’s inordinate fear of the MEK. That remains good advice, but there’s not another four years to wait. In a striking coincidence, two very different expressions of Iranian dissent took place exactly simultaneously on two continents on Saturday, June 20. Between them, the Islamic Republic of Iran faces an unprecedented challenge. 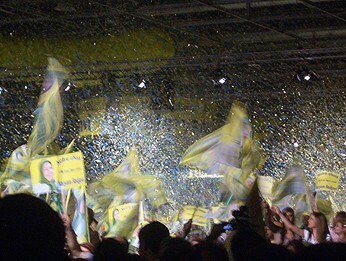 In a vast exhibition hall just north of Paris on June 20, about 20,000 people attended anevent organized by the largest and best organized Iranian opposition group, the Mujahedeen-e Khalq (or the People’s Mujahedeen of Iran). One protest took place on the streets of Iran, where thousands of Iranians fed up with living under a religious tyranny defied Supreme Leader Ali Khamene’i’s diktat that they accept the results of the June 12 presidential election, whereby President Mahmoud Ahmadinejad supposedly defeated his main challenger Mir Hossein Mousavi by a lopsided margin. This timidity stands in contrast to the bold stance of the street protestors who shout “Death to the dictator” and even “Death to Khamene’i,” an echo of the regime’s perpetual slogans “Death to America” and “Death to Israel,” implying a wish not just to correct Khomeini’s “sacred system” but an aspiration to terminate the regime dominated by mullahs (Iran’s clerics). 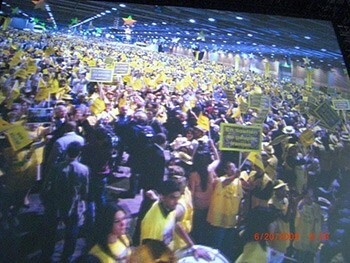 The other protest took place in a vast exhibition hall just north of Paris, where the largest and best organized Iranian opposition group, the Mujahedeen-e Khalq or the People’s Mujahedeen of Iran (MeK or PMOI) joined with smaller groups to hold their annual meeting. Tens of thousands attended it, including me. The assembly’s most emotional moment came when the anxious crowd learned that their peaceful counterparts marching in Iran had been killed or wounded. At that moment, freedom of assembly in France contrasted most starkly with its denial in Iran. Later that day came confirmation of the regime’s obsessive fears of the MeK, when deputy police chief, Ahmad Reza Radan, blamed MeK “thugs” for his own government’s violence against the peaceful demonstrators. Ridiculed the regime for portraying the demonstrators as Western agents. Bitterly complained that corpses of demonstrators were “wrapped in American flags” and then trampled upon. Condemned the regime’s “crimes” in Iraq and its “export of terrorism” to Lebanon, the Palestinian Authority, and Afghanistan. Predicted that “the beginning of the end” of the Islamic Republic of Iran is underway. Critiqued the Obama administration for giving yet another chance to the regime, noting that the Bush administration had met its representatives 28 times to no avail. Sadly, standing up to the mullahs has never been American policy. Jimmy Carter meekly accepted their rule. Ronald Reagan sent them arms. To win their favor, Bill Clinton put the MEK on the terrorism list. George W. Bush did not foil their nuclear weapons project. And Barack Obama hopes to gain concessions from Tehran on the nuclear weapons issue by distancing himself from the dissidents. Instead, flux in Iran should invite boldness and innovation. It is time, finally, for a robust U.S. policy that encourages those yelling “Death to Khamene’i” and that takes advantage of the hyperbolic fear the MeK arouses in Iran’s ruling circles (first step: end the MeK’s preposterous listing as a terrorist organization). As Rep. Peter Hoekstra (Republican of Michigan) notes, regime change in Iran becomes the more urgent if the mullahs will soon deploy nuclear weapons. The vital and potentially victorious movement building both on the streets of Iran and in the halls of Europe better represents not only Western values but also Western interests.